Have you wondered where all of the carbon emitted into the atmosphere is stored? One of the unsung heroes in the carbon storage story might just be eelgrass, a unique piece of estuarine vegetation that also protects the shoreline from storms and provides vital fish habitat. Eelgrass (and seagrasses in general) are important because they provide shoreline protection from battering seas and act as a buffer against ocean acidification by providing vital carbon storage. However, seagrasses (especially in temperate areas) are under threat from predicted climate changes because increasing water temperatures and rising sea levels can increase the number of summer die-offs. When eelgrass populations decline, their mitigating effects are lost. A study by Phil Colarusso and colleagues, funded by the U.S. Environmental Protection Agency (EPA) Climate Ready Estuaries Program, sought to determine if there was a potential to quantify the carbon capture and storage capacity of eelgrass (Zostera marina) beds in coastal Massachusetts waters. This study was conducted in part because limited research has focused on carbon sequestration potential of seagrass in temperate areas compared to other marine habitats such as mangroves and salt marshes. 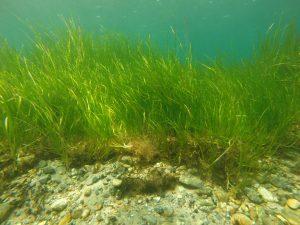 The researchers estimated carbon storage in eelgrass beds at various sites from the southeastern shore of Massachusetts to Cape Ann between July and September 2015. They chose five sample sites throughout Massachusetts and quantified the seagrass meadow extent using side-scan acoustic imagery (a method of creating images of the seafloor), aerial photos, diver verification and direct observations. The researchers then took sediment core samples to analyze the contents from each location. They determined the presence of carbon, nitrogen, stable isotopes and organic matter in each. Additionally, they calculated wave exposure index for each site. 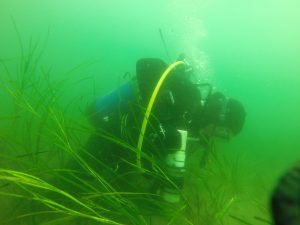 The researchers found that sediments within eelgrass meadows stored more carbon than sediments in adjacent unvegetated areas. Furthermore, they found that carbon in seagrass meadows is sequestered through both direct fixation by the eelgrass, and through collection of phytoplankton that fall to the seafloor. However, they found that there was no correlation between carbon storage amount and wave exposure indices. This means that coastal seagrass beds provide greater storage of carbon than unvegetated sites, and that the amount of carbon that could be stored is not affected by the power of the waves. The results of this study were presented at a workshop that sought to determine if it was possible to estimate the total carbon storage value of eelgrass in the entirety of coastal MA. The workshop and it’s members concluded that quantifying carbon storage in these coastal habitats was possible, provided that accurate mapping estimates of existing eelgrass were acquired. To do so, the researchers secured funding for additional research for 2016 and 2017, and have expanded the study to include sites in Maine, New Hampshire and Rhode Island. This research has potential implications for the future of eelgrass preservation, restoration and protection in other temperate areas based on its findings. Small Fish in a Big City: Can Urban Restoration Increase Juvenile Fish Densities in Degraded Habitats?